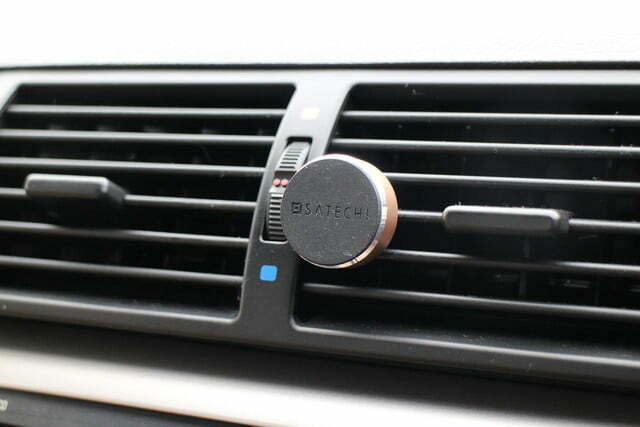 Satechi’s magnetic vent mount looks sleek and attractive in your car, but the magnet isn’t strong enough to hold up heavy phones. 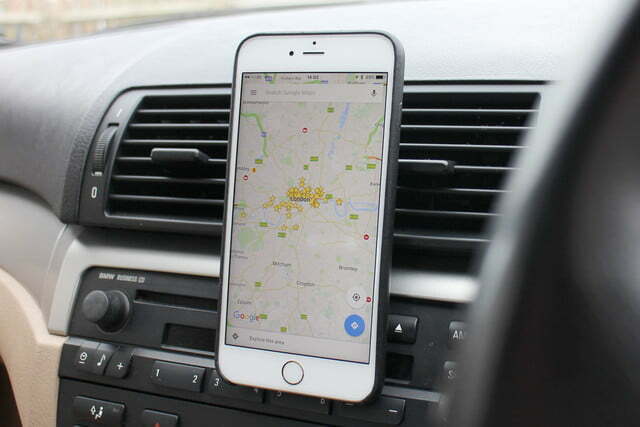 When you think of an in-car smartphone mount, it’s usually an image of ugly, twisted piece of plastic and metal, attached to a huge sucker cup. 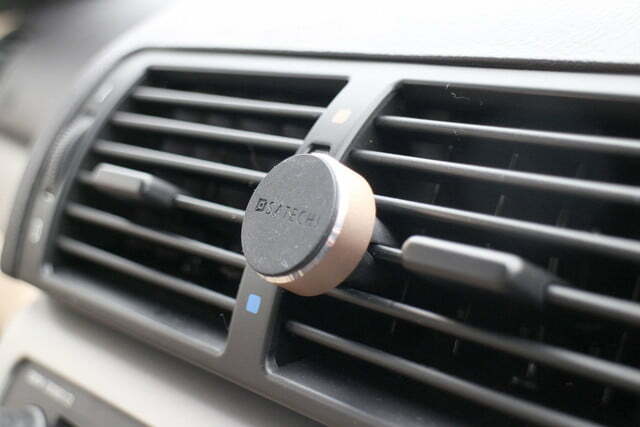 Not so with the Satechi Magnet Vent Mount. 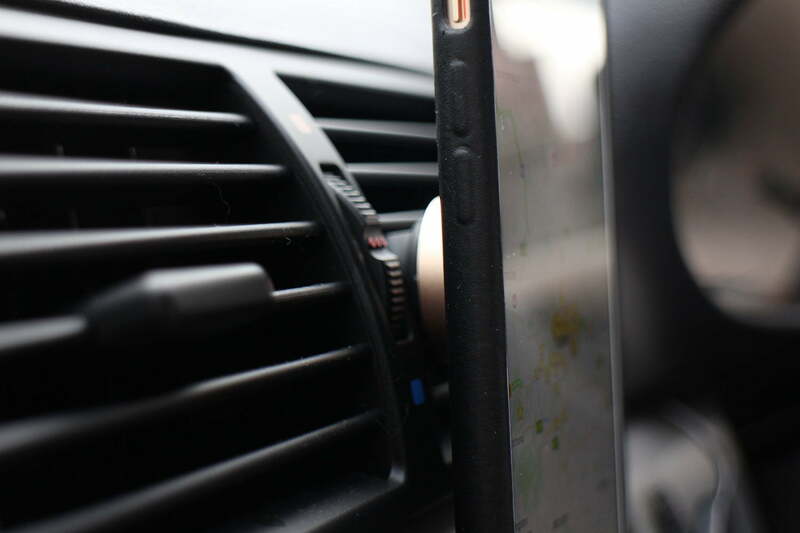 It’s small, unobtrusive, and beautifully designed — especially in the world of phone mounts. How does such a small, pretty thing manage to cling onto your phone? With a big magnet. The way it works is shockingly simple. 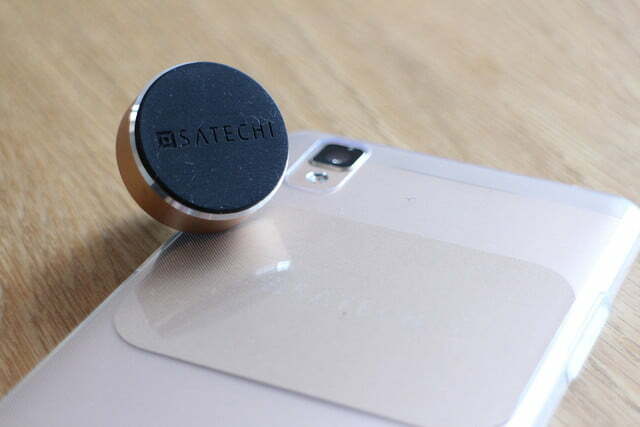 There are two parts to the Satechi vent mount: the mount itself, and a thin piece of metal, which is placed inside the case on your phone. You don’t use a case? 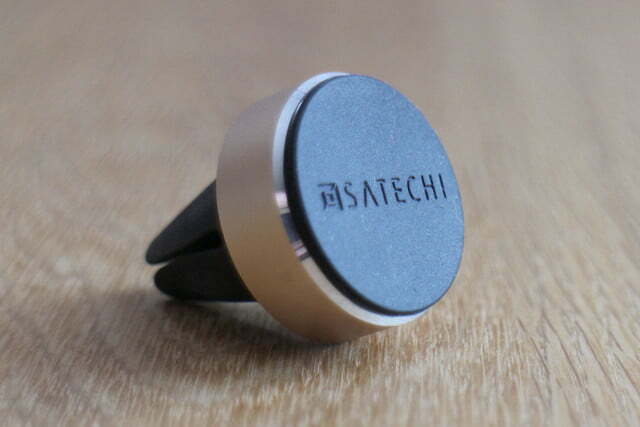 Then the Satechi may not be for you, but it does come with a separate metal disc that can be stuck to your phone’s body. However, this is a very permanent solution, and one we’d not be inclined to use. 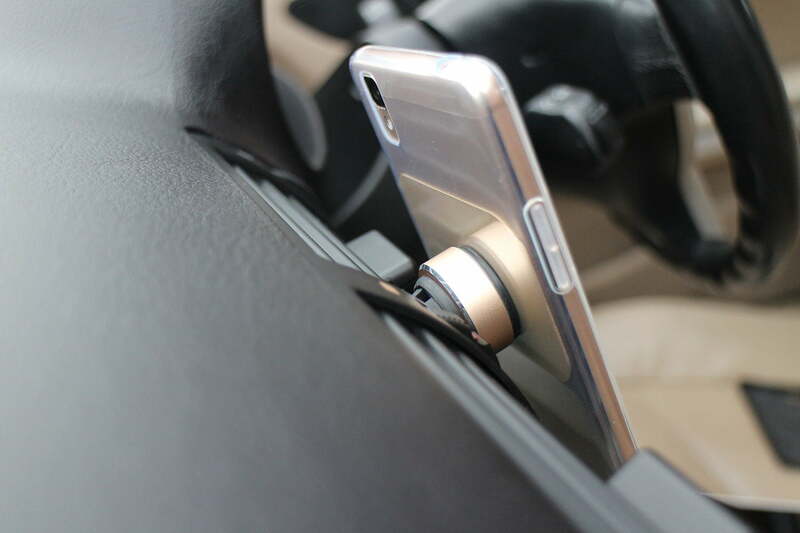 Once the 2-inch by 1-inch plate is safely hidden inside the case, the circular mount is fixed to a handy vent inside your car. 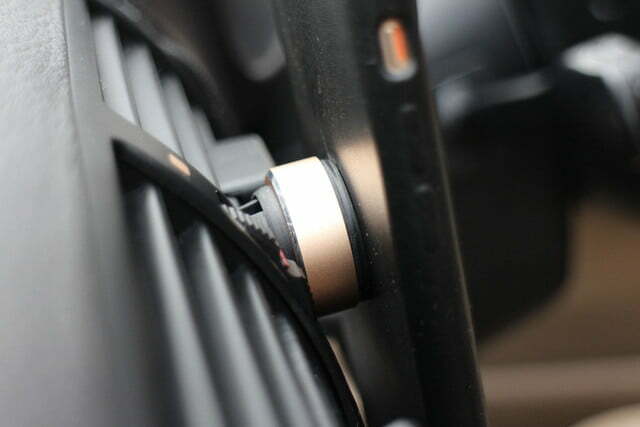 There are four rubber-coated prongs sticking out of the back of the mount, which are slid onto the vent, holding it securely in place. 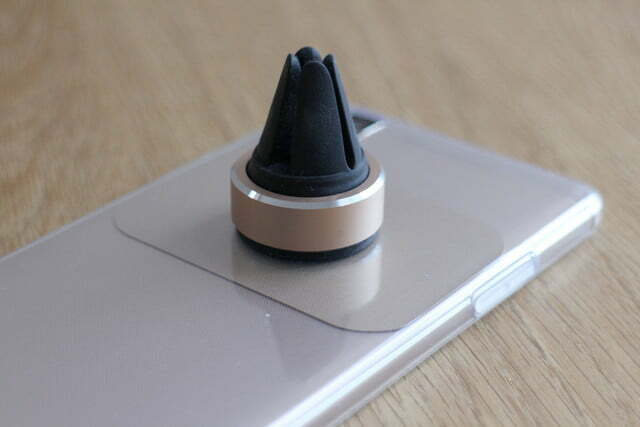 The phone then magnetically attaches to the mount, so it floats in the air as if held there by magic. It’s a neat solution. However, does it work? Yes, it does, but there are some problems. The biggest issue is what phone you own. 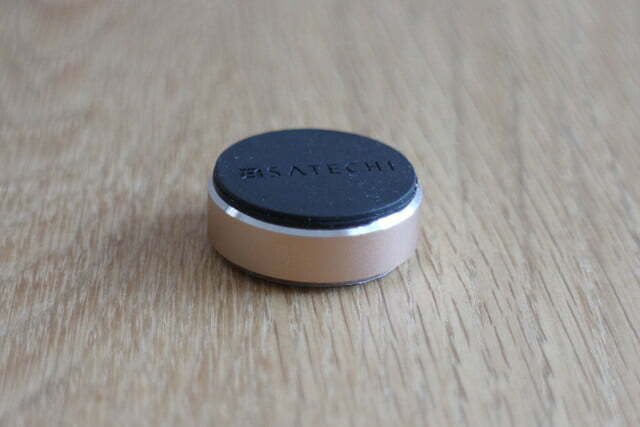 The Satechi mount’s magnet is strong, but it’s not really strong. 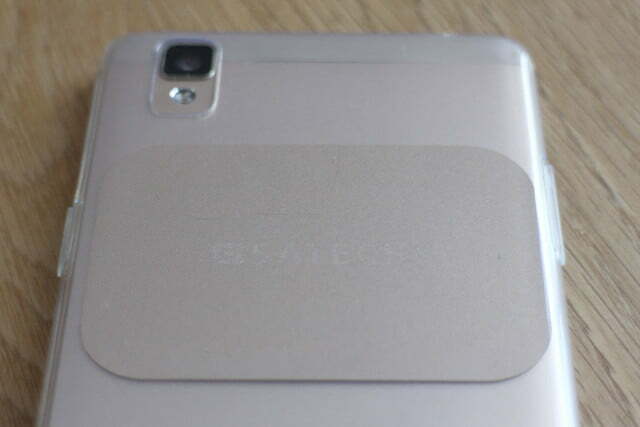 The effect is also dulled by the thickness of the case in-between it and the metal plate. This means if you own a big, heavy phone, then it never feels absolutely firmly attached. How heavy is heavy? I used an iPhone 6S Plus with an Apple leather case, and I was concerned about how easy it was to separate the phone from the mount. Trust is important in this type of product. I didn’t want my phone to disappear under the brake pedal, and I didn’t want to have a huge accident because of my resulting panic. However, using the mount with the Oppo F1 and its supplied silicone case felt way more secure. The difference is, the F1 weighs 134 grams, and the iPhone 192 grams. No, the iPhone never fell off, but it never felt completely secure either. Driving along some pothole-ridden roads made the phone slip, so I had to take it off and just leave it on the passenger seat. Another issue is the inability to adjust the angle. In my car, the way the vent mount attached meant the phone couldn’t be angled towards me, and instead faced squarely into the car. This presents issues with clarity when following directions, and reflections caused by the sun. However, this may not be a problem for everyone, because it depends on the how the vents are set up in your car. I also feared the magnet may affect reception, but the bars displayed on screen never altered when it was placed on the mount. The other thing to consider is what you’re expecting to do with your phone once it’s attached. 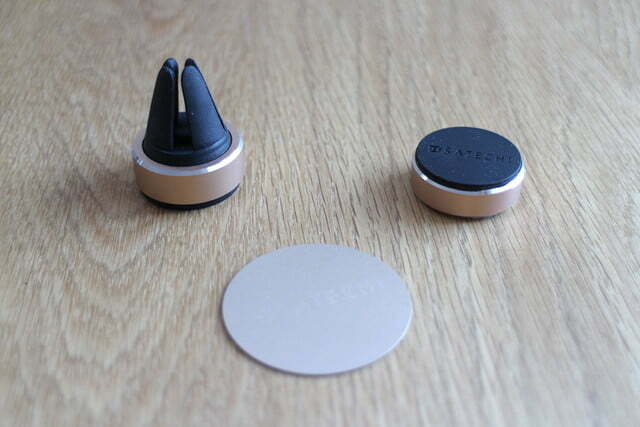 Because the magnet isn’t amazingly strong, the touchscreen needs to be lightly caressed, otherwise it can come unstuck, making complicated actions difficult. It’s also not secure enough to use the iPhone’s Touch ID fingerprint sensor easily, and obviously forget about any sensors on the back of your phone — they’re out of reach entirely. If you only want to follow GPS directions, it’s ideal, but for much else, you want to consider something stronger. 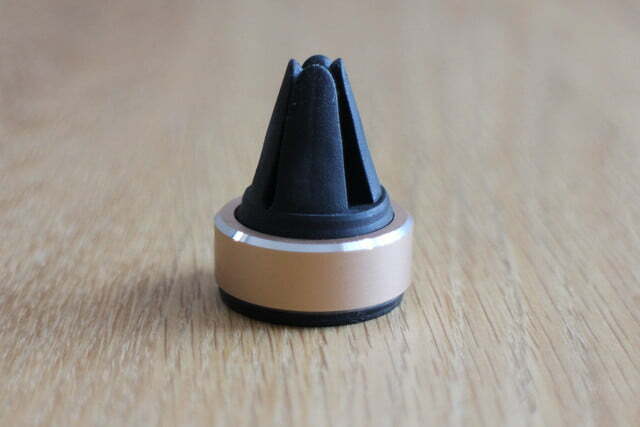 The company also sells a mount with a sticky pad in place of the prongs, making it suitable for fixing just about anywhere. 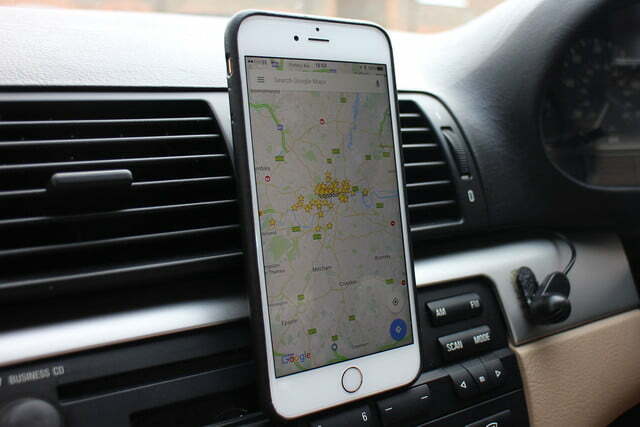 Provided your expectations are in check with the Satechi Vent Mount’s strength, it works well, is suitably subtle, isn’t difficult to store inside the car (unlike some of the larger, more spidery contraptions available), and for just $20, it’s excellent value. Just be cautious if you own a heavy phone.